Habit: Glandular-puberulent; branches rigidly ascending to erect, leafy. Leaf: 1--3 cm, oblanceolate to obovate. Flower: calyx 8--15 mm, narrowly bell-shaped, lobes 4--5, 1.5--3 mm, 1/2 to = tube; corolla narrowly funnel-shaped, green-white, lavender-tinged or -veined, abaxially glabrous or puberulent, tube 9--12 mm, lobes ovate-triangular; stamens +- exserted, attached +- at tube middle. Fruit: 5--9 mm, yellow to orange, with 2 cross-grooves above middle. Seed: several. 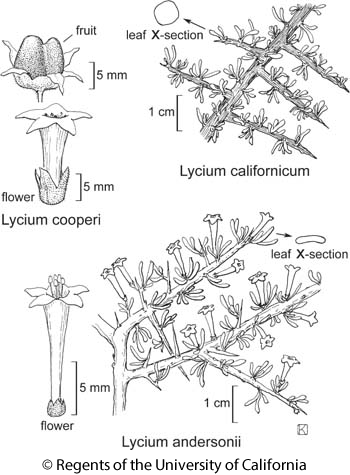 Citation for this treatment: Michael H. Nee 2012, Lycium cooperi, in Jepson Flora Project (eds.) Jepson eFlora, http://ucjeps.berkeley.edu/eflora/eflora_display.php?tid=32210, accessed on April 19, 2019. SNH (e slope), s SnJV, SNE, D; Markers link to CCH specimen records. Yellow markers indicate records that may provide evidence for eFlora range revision or may have georeferencing or identification issues. Purple markers indicate specimens collected from a garden, greenhouse, or other non-wild location.